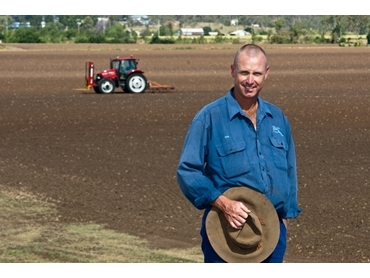 Queensland vegetable grower, Troy Parchert, has simplified his vegetable farming operation with machinery and finance packages from Case IH . Troy and his father Barry, run Creekside Fresh in Gatton, Queensland, where about 14 hectares is dedicated to the turf production of two main crops, lettuce and cauliflower. Troy and Barry own 11 Case IH machines, including four they purchased at the end of the last financial year. Those most recent purchases are a Maxxum 110, JX 80 cab, JXU 105 and a JXU 85. They already owned a Maxxum 255, JXU 90, two CX 90s, a CX 70, a JX 75 and a JX 65. Most of the machines are used across a variety of tasks and are in use six days per week during harvest, generally with seasonal employees at the controls. The MX 255 is usually reserved for hoeing duties, while the new JXU 105 is generally dedicated to herbicide boom spraying. Further to this, Troy's decision to select a loan and goods mortgage for his purchases, which immediately transfers title to him, meant Troy was eligible for the Federal Government tax break incentive when he bought his new tractors. While the loan and goods mortgage product was ideal for Troy, other finance packages have different features that might be more appropriate for other operations. Case IH dealerships have a broad range of specialist equipment finance packages on offer to suit customers’ varying requirements, from farmers looking for tax effective accounting strategies and improved cashflow, to those wanting the latest equipment without having to worry about maintenance.